60 wax occlusions, 21 infections, two Piñata foam pieces and a live insect (a cochineal)! - some otoscopy findings during your typical week of hearing screening in Lima. In September 2018, I was fortunate to be allowed to be part of a small team of Sonova volunteers, who travelled to Lima Peru. Our mission was to screen at least 4000 children for hearing loss within five days. Early morning on day one of the project we traveled on the busy roads of Beirut heading north to Ghazir. The partner Houri Hearing had allowed us to use their Ghazir clinic to carry out follow-ups for the Syrian children Although Peru has adopted the universal neonatal screening policy, with only 10 audiologists for 32 million habitants, the majority of newborns and infants remain untested for hearing loss. 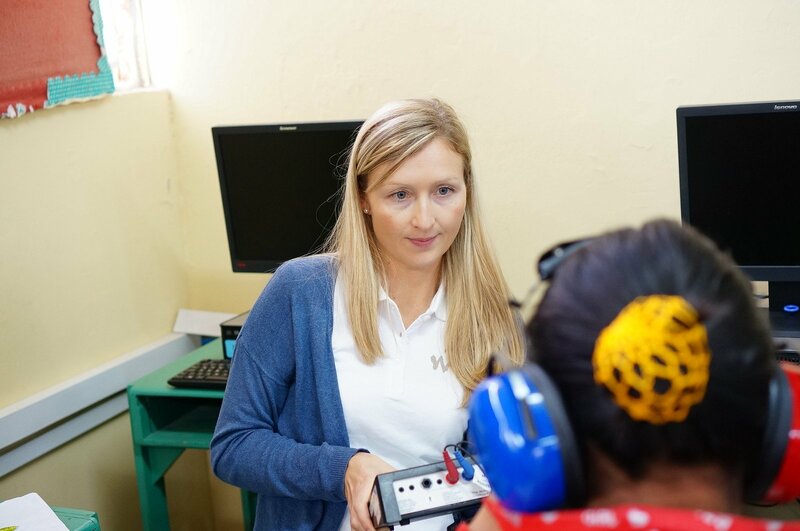 For this reason, the Hear the World Foundation and World Wide Hearing Foundation International jointly launched a program in 2016 to test underserved children in Peru for hearing loss. Their goal of screening over 30,000 children was achieved in November 2018. The screening was for the most part carried out by local audiologists/speech therapy students. However, in order to reach the ambitious goal of 30,000 children, four missions were organized where Sonova volunteers flew in from around the world and carried out mass hearing screenings within a week. In addition to helping with hearing screenings, the role of the volunteers was also to share knowledge and skill development with local staff. I took part in the last of these four missions and by then, the system was like a well-oiled machine! What did our working week look like? Morning: Hearing aid fittings of children who had been diagnosed with hearing loss during the last volunteer mission. Afternoon: Training on screening equipment, screening process and a crash course in Spanish! Travel to a school on the outskirts of Lima. Set up screening stations. Test a lot of ears! De-brief. Travel back to accommodation and re-charge equipment for the next day. How did the screening set-up work? At each school, we set up three stations; an otoscopy station, a screening station and a re-test station. 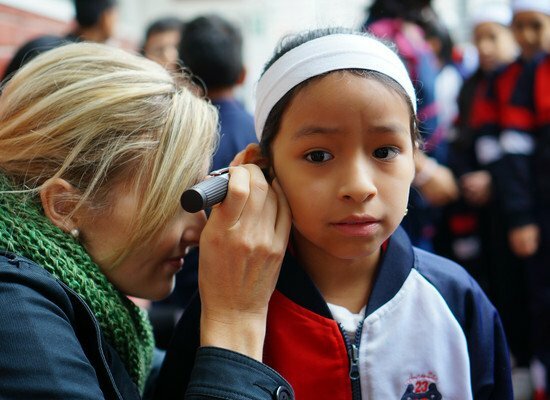 For otoscopy, the children were lined up and two audiologists would look in their ears one-by-one. Any foreign bodies, wax occlusion or infections were noted. Children would then move onto the screening station. The screening station consisted of around 6 volunteers with a touchscreen audiometer. Children who had been at the otoscopy station would take a seat in front of one of the volunteers and the volunteer could practice their best Spanish! “Si escucha, levanta la mano” (If you hear something, raise your hand). At the beginning, many of us non-Spanish speaking volunteers were struggling to remember this phrase, but as you can imagine, by the end of the mission, it was well and truly engraved on our brain! Children who passed the screen were sent back to class (“Pasa!”). Children who didn’t pass, were directed to the re-test station. At the re-test station, situated in a quieter environment with an experienced pediatric audiologist, a more accurate hearing test was performed. Many children passed and went back to class. Those who appeared to have hearing loss had their name taken, in order to be offered an appointment with a Peruvian audiologist in a hearing clinic, for further assessment and if necessary, hearing aid fitting. Total number of referrals to the clinic in 5 days: 58 out of the 4487 people screened (43 children, 15 adult staff members of the school). What happened to the children who were referred to the hearing clinic? 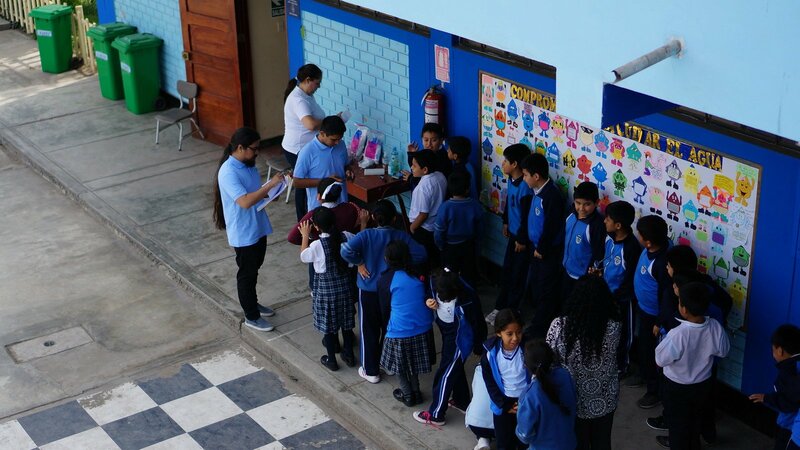 Several of the 58 referrals have already been re-tested in the Peruvian hearing aid clinic and three of them have already received hearing aids. What happened to the volunteers? We were exhausted after a long week but left on a high, feeling a massive sense of achievement and very grateful to have had the opportunity to participate in this truly worthwhile experience. Of course we went back to our normal working lives in Sonova, but as one volunteer (Tania) so nicely put it, we left a little bit of our hearts in Peru. We invite you to watch this short video featuring the #HearPeru mission.